Does Bing Know About Your Website? Google may know all about your nonprofit’s website (and your blog, and your MySpace or Facebook page, or whatever other social media profiles you’ve staked out on the Web), but that doesn’t guarantee that Microsoft’s new search engine, Bing.com, will automatically index your site as well. Just for fun, check out Bing-vs-Google.com and run a search on the keywords that people typically use to find your website — and see the difference! So, since Bing works off an different database than Google (or Yahoo, or any of the other leading search engines), and since Bing is the fastest growing US search engine in the top ten, with a 10% market share reported in September, you’ll want to make sure your site is indexed, crawled, and listed by Bing as well as other search engines. Go to http://www.bing.com/docs/submit.aspx, Bing’s (free) site submission page. Enter the letters and numbers shown in the “captcha” image, just to prove you’re a real person. Enter the main web address for your website — for example, Wild Apricot would enter https://www.wildapricot.com/ in the submission form. Check for typos!! Then click the Submit URL button. The search spider MSNBot will follow the links from your homepage to find other pages on your site. It may take a while for Bing to find and index all the pages on your website, however, or the MSNBot may not fully crawl your site. That’s where submitting a dynamic sitemap, a simple webpage with a linked list of all the pages on your site, or the RSS feed for your blog can help you. You may already be familiar with the useful Google Webmaster Tools that help webmasters to make the most of Google search? 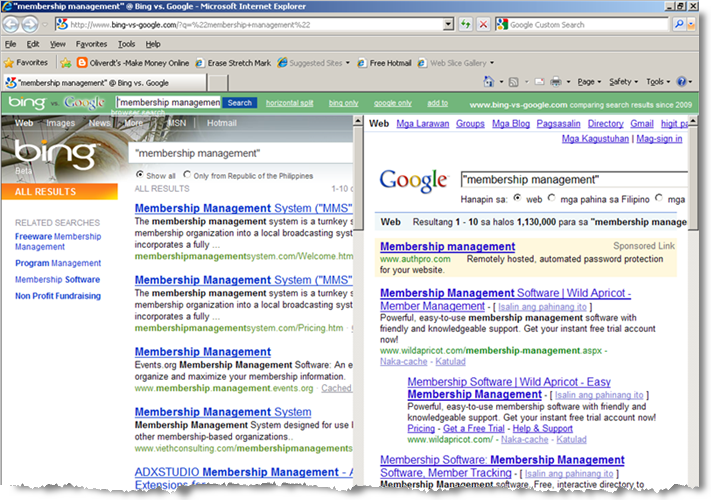 A similar toolbox is available at the Bing Webmaster Center. You’ll need to sign up for a (free) Windows Live ID (gets you into MSN/Hotmail as well) to use the suite of webmaster tools, but if Google’s anything to go by, the results for your search engine optimization should be worth the small extra effort. While a nice thing to have, is it really a loss? The vast majority of internet users use Google and Microsoft has tried the angle of competing with Google in the past with limited success. And the numbers may very well shift now that Windows7 has launched, with Bing is the default search provider for IE8, the default browser. I wonder what percentage of people are happy to keep the defaults or lack the tech confidence to change them? Another interesting thing I just discovered... when temporarily forced to use IE 8 for a browser: Bing is really wound right in there. I'd bookmarked a Google search, then went in to edit the bookmark to customize how it showed up on the Favorites bar. Not paying full attention, I double-clicked on the URL in the bookmark pop-up, and it automatically changed the URL from a Google Search results page to Bing! It's interesting to see that I have submitted www.peninsulashops.com several times to Bing with Minimal Results only to find that when searching for Peninsula Shops a well paid for ad by a nationally recognized chain shows up.